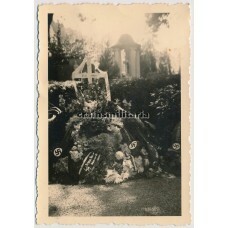 Grave of a political or SS individual named Fritz Weber, in the Heimat, decorated by an SS Sturmbann.. 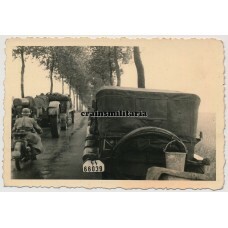 Vehicle column with insignia of the 3rd SS Totenkopf Division and SS license plate. 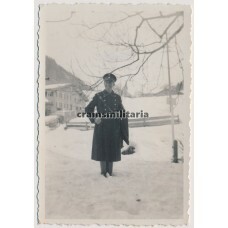 SdKfz 10 on the ..
Man in Allgemeine SS uniform posing on the Austrian border. 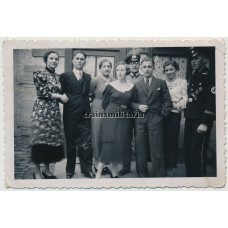 6x9 cm Agfa Lupex private photo, d.. 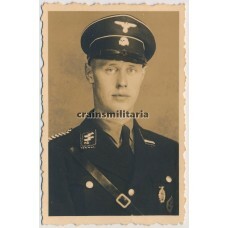 Portrait photo of a Sturmführer of the Allgemeine SS, wearing a party pin and WWI ribbon bar. &.. 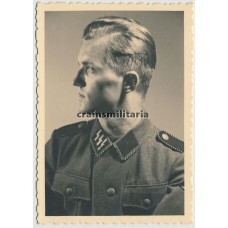 Portrait photo of a member of the Allgemeine SS in 1944. 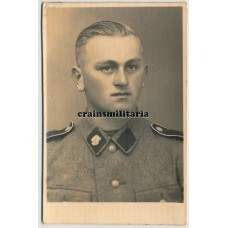 5x7 cm private photo with handwr..
Postcard sized portrait of a member of the Allgemeine SS Standarte 30 in December 1939. 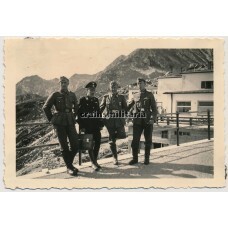 Very sharp, ..
Man in uniform of the Allgemeine SS in the mountains, presumably Austria or Bayern. 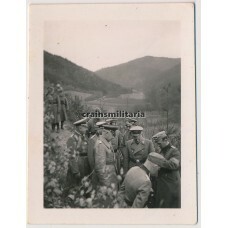 6x9 c..
Man in uniform of the Allgemeine SS in the mountains, presumably Austria or Bayern. 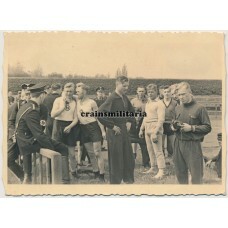 Numbe..
Members of the Allgemeine SS during a sports event, around 1939. 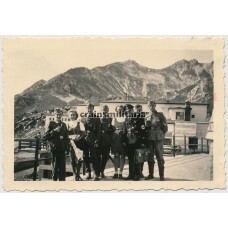 7x10 cm Agfa Brovira pri..
Group portrait of friends, including a member of the Allgemeine SS wearing the Brandenburg cufftitle..
SS Sturmmann wearing the Infanterie-Sturmabzeichen and Verwundetenabzeichen with a Heer comrade.&nbs..
Obergefreiter Peters of the 117. 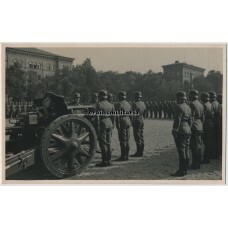 Jäger-Division, drawing signed by an SS soldier Kauer. Captio.. 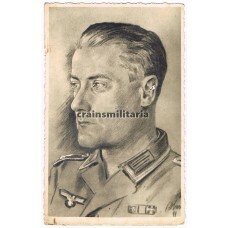 Drawing signed by an SS soldier Kauer of a decorated Unteroffizier. 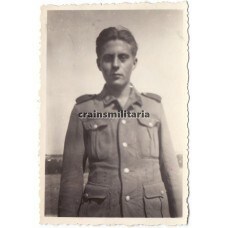 Agfa postcard.. 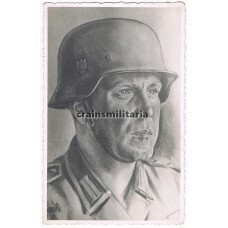 Drawing signed by an SS soldier Kauer of an Unteroffizier with steel helmet. 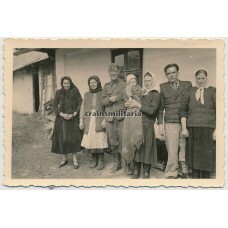 Agfa postcard.. 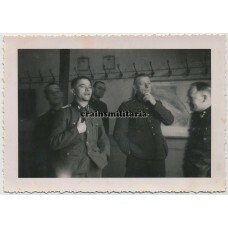 Early SS soldier with Heer comrades in barracks, November 1934. 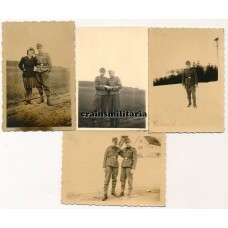 6x9 cm Agfa Lupex private phot..
Five group portraits featuring an SS-Sturmmann. 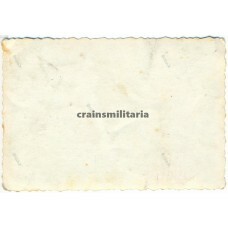 6x9 cm. 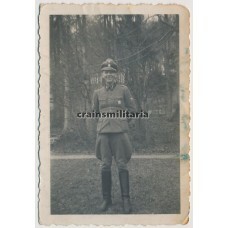 ..
Large postcard sized private portrait photo of SS officier Karl-Heinz Bestmann. 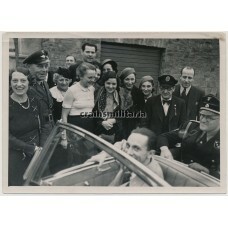 Born May 1917 in Lüb..
Press photo of Joseph Goebbels and an SS officer, admired by civilians and uniformed men. 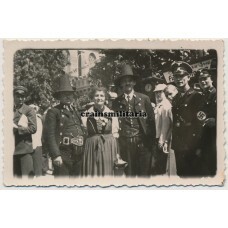 Back..
Adolf Hitler, joined by high SS officers, during the parade of the V. Armeekorps on 17th of Septembe..
Postcard sized portrait of an SS soldier in Wiesbaden. 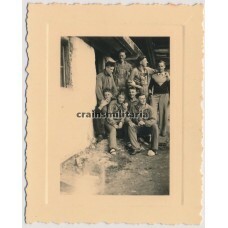 Private Agfa postcard, excellent c..
Postcard sized group portrait of the SA Sturm of Bretnig, today Bretnig-Hauswalde in Sachsen. 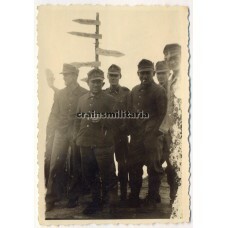 Also i..
Four photos of Das Reich soldiers celebrating Christmas or New Year's Eve. 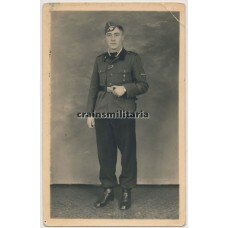 Notice the decorate..
SS Deutschland soldiers wearing cufftitles and the "D" shoulder boards with local population in cent..
Small portrait photo of a young SS Deutschland recruit wearing the "SS 1" collar tabs, and also part..
SS-Verfügungstruppe with clear "Deutschland" shoulder boards on the Western Front, 1940. 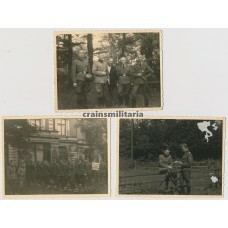 6x7 c..
Grouping of eight photos of the same SS Deutschland veteran, centered around a superb postcard sized.. 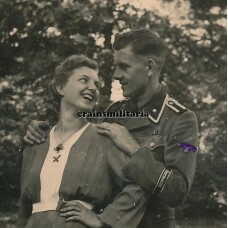 Portrait of an SS Gebirgsjäger and a Heer comrade. Edelweiss clearly visible. 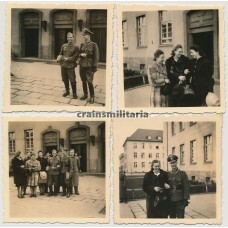 6x9 cm..
Four photos of an SS Gebirgsjäger with wife and friends. 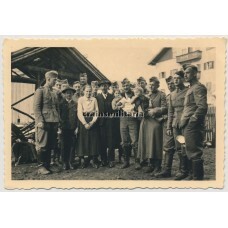 One photo clearly shows the Edelweiss patch.. 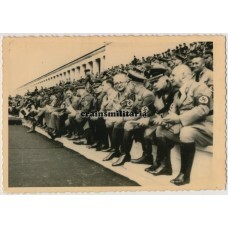 Private photo of Wilhelm Murr, SS-Obergruppenführer and NSDAP official, Gauleiter and Reichsstatthal..
High officers, including an SS officer, visiting the Olympics in Berlin, 1936. 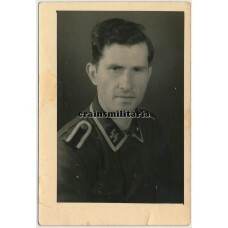 11x8 cm pr..
Photo grouping to an Unterscharführer of the SS Germania Standarte / Regiment. Totals 18 private pho..
Photo grouping of 21 photos of a member of the 9. SS-Panzer-Division “Hohenstaufen”. 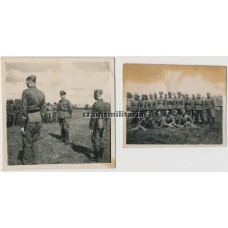 The photos are ..
Two photos of SS officers and soldiers in Russia, June 1943. 6x6 cm Ridax and 5.5x4.5 cm, with.. 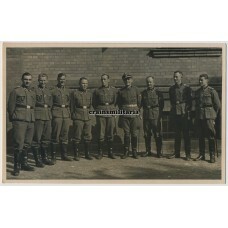 Private postcard sized group portrait of an SS officer posing with his NCO's - likely staff members ..
SS and Heer officers during a meeting on the Western Front. 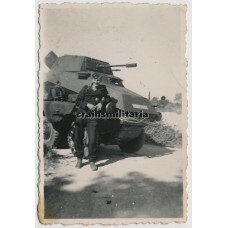 7x10 cm Agfa Brovira private ..
Young SS Panzermann wearing a HJ-Leistungsabzeichen standing next to an SdKfz 231 Panzerspähwagen, p.. 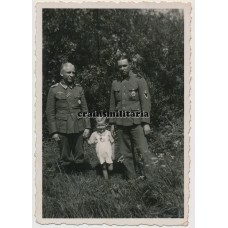 Portrait of an SS Polizei member wearing an early uniform: Heer Feldbluse with sleeve eagle and SS r..
SS Soldier posing with Polish civilians. 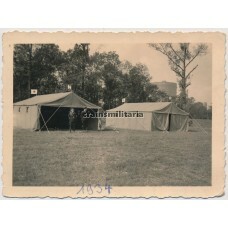 6x9 cm Agfa Lupex very sharp private photo, desc..
Allgemeine SS hospital tents, with SS flag, in 1934. 6x9 cm Agfa Lupex private photo. .. 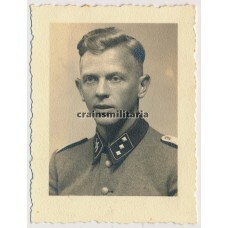 Portrait of an SS soldier with (unreadable) cuffitle. 6x8 cm Agfa Lupex private photo. 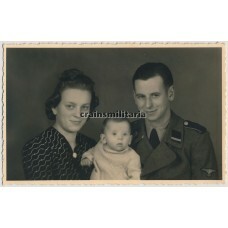 ..
Group portrait of an SS soldier with his family. 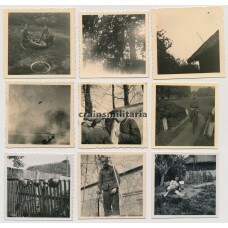 6x6 cm Agfa Brovira. 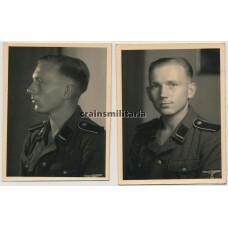 ..
Two portraits of an SS Sturmmann in September 1944. 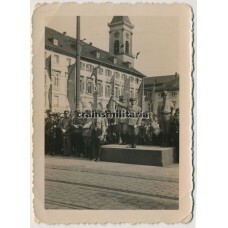 Both photos are stamped by a maker from "K..
Postcard sized private photo of a swearing in ceremony of soldiers of an SS Artillerie-Regiment.&nbs.. 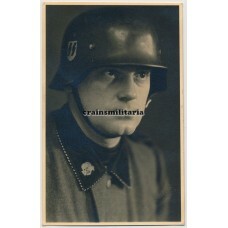 Superb postcard sized portrait of an SS Totenkopf soldier wearing his helmet. 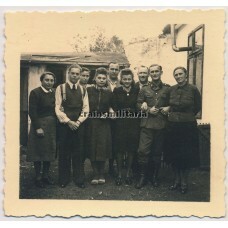 Great detail of the TK..
Four photos of an SS Unterscharführer and other soldiers with women. 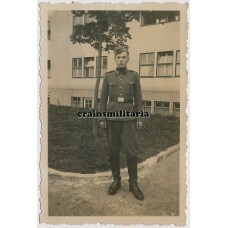 He is wearing the Totenkopf col.. 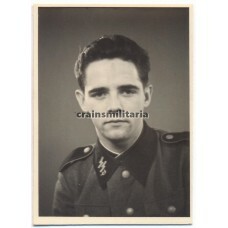 Portrait photo of an SS Totenkopf soldier with nice view of the collar tabs. 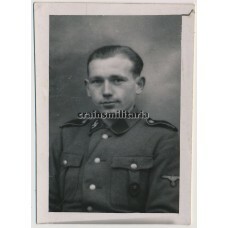 4x6 cm priva..
Great quality family portrait of an SS Totenkopf soldier in StuG wrapper. 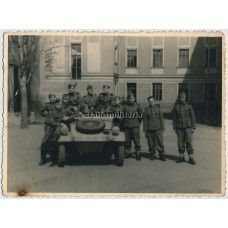 Embossed photo studi..
SS Soldiers posing with a Volkswagen Kübelwagen Typ 82 with SS license plate. 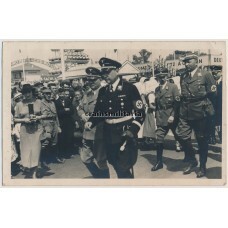 11x8 cm pri..
High SS, SA and political leaders visiting a fair in Sachsen, Germany. 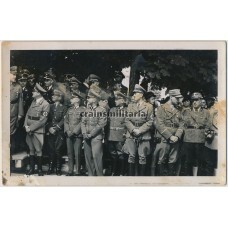 First row: NSDAP offici..
SS, SA, political and Wehrmacht officers lined up, probably during a parade. Studio stamp "Hro.. 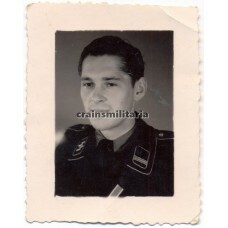 Portrait of an SS-Rottenführer in black uniform, wearing the EK2 ribbon. 5x6 cm Agfa Lupex.. 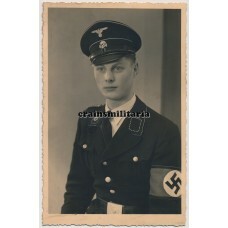 Portrait of an SS-Rottenführer wearing his Totenkopf Schirmmütze, EK2 ribbon and Allgemeines Sturmab.. 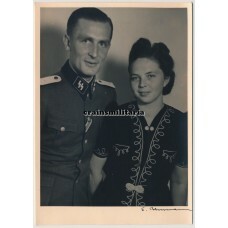 Portrait photo of an SS Sturmmann with his wife in Thorn. 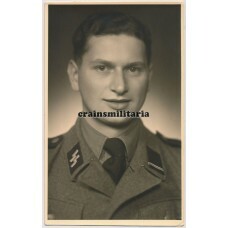 Clear view of Totenkopf eagle on his..
SS-Verfügungstruppe portrait with rare collar tabs, showing a Gothic "P" next to the runes. 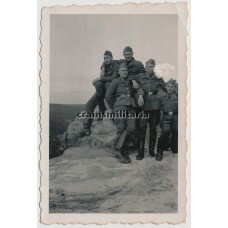 Th..
SS Verfügungstruppe soldiers on a mountain. 6x9 cm private photo. .. 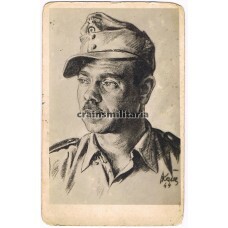 Studio portrait of an SS Grenadier. 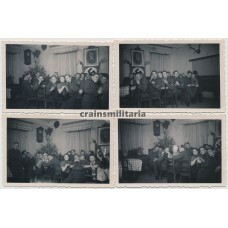 5x8 cm Agfa Brovira.. Tropical SS soldiers, including one wearing an SS helmet and cufftitle. 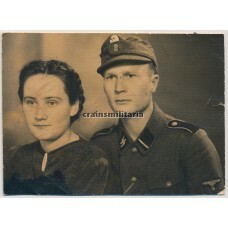 6x9 cm Agfa Lupex priv..
Woman and men wearing SS sweaters in Bavaria. 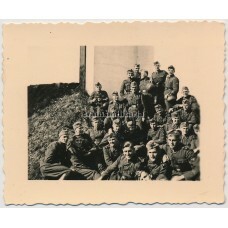 6x7 cm Agfa Lupex private photo. 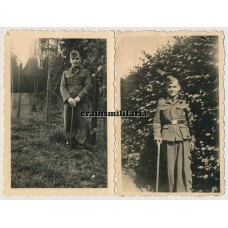 ..
Two portrait photos showing a wounded SS soldier wearing the "Der Führer" cufftitle. 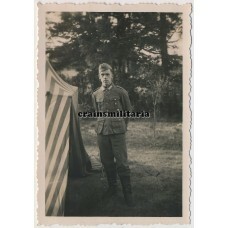 6x9 ..
Field portrait of a young SS artillery soldier wearing the Hitlerjugend Leistungsabzeichen, 1943.&nb..
Foreign SS members (see the headgear!) harassing a woman on the Eastern Front. 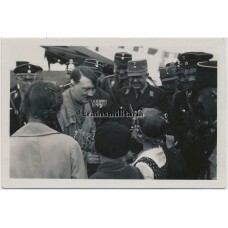 6x9 cm Ridax..
Adolf Hitler, accompanied by SS and party officials, meeting children in the 1930's. 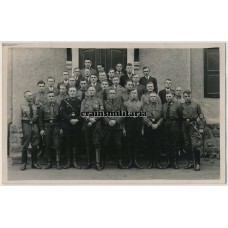 6x9 cm pr..
NSDAP, SA, SS officials and other 'Prominenz', including a Wehrmacht general and Allgemeine SS offic.. 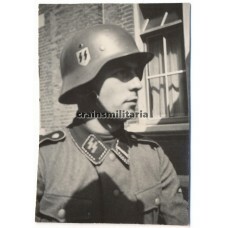 Portrait of an SS soldier with nice helmet and insignia details. 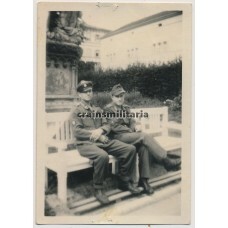 8x5 cm, captioned "1940"..
SS Soldiers posing near a signpost with fictuous names (Villa Auspuff etc). 6x9 cm Agfa Lupex.. 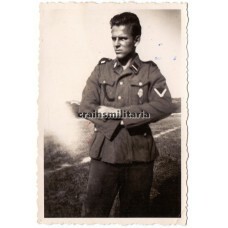 Portrait of an SS Untersturmführer in the field. 6x9 cm, no descriptions. 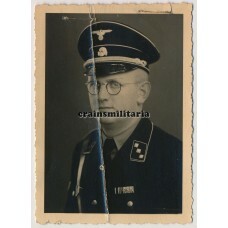 ..
Small sized studio portrait of an SS Untersturmführer. 5x6 cm with studio stamp of Aug. Knauf .. 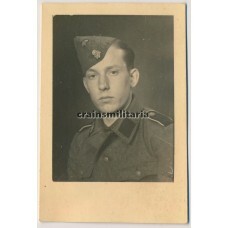 Portrait of an SS-VT Soldier with very clear view of the SS-Nachrichtensturmbann (signals unit) coll.. 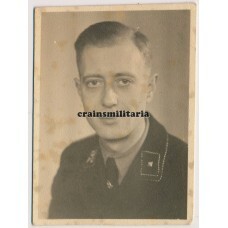 Portrait photo of a member of the SS-VT Standarte 2: Germania. 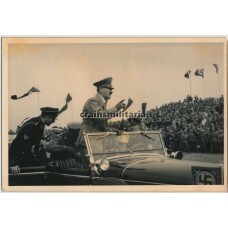 Nice view of political awards, ..
Three late-war photos of SS officers. 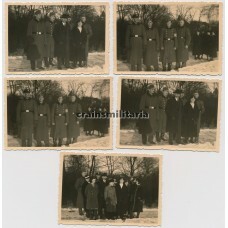 Photos were found in the US, one has handwritten America..
Members of the Allgemeine SS in the 1930's. 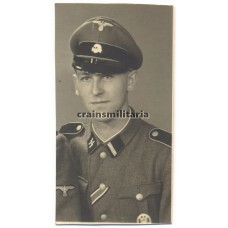 6x9 cm private photo ..
Small portrait of an SS Schütze with Verwundetenabzeichen in 1944. 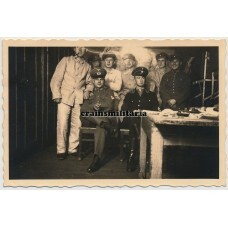 5x7 cm private photo, descr.. 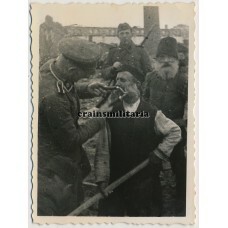 Portrait to an SS Unterscharführer. 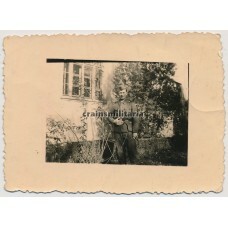 6x9 cm Agfa Brovira private photo. 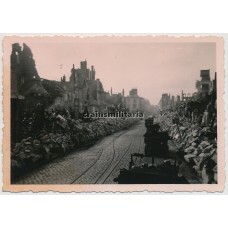 ..
SS Verfügungstruppe vehicles, almost certainly of the Deutschland regiment, passing through a destro..